In 2008 I was so blessed to be able to go to the Holy Land. I wrote the following during Christmas that year, as a letter to Father Lopez. I now share it with you. It was Christmas Day, and we planned to attend the 10:30 Mass. At 9:45 we were in our bedroom getting ready for Mass when the doorbell rang. Since we live off of a dirt road and are fairly far from most folks, it is rare that the doorbell rings unexpectedly. It was my sister, with whom I had not spoken for five years. I raised her children, and now I have her biological granddaughter, 16-month-old Alli. Alli has been in my home for the last three months. My sister is standing on my doorstep with her arms full of presents and she wants to see the baby. Needless to say, we are late getting out the door. The trip to Church is silent, as we are stressed by being late and by all that has occurred in a few short minutes. Much later I will reflect back and realize that this was a grace to be offered reconciliation on Christmas, and certainly an acceptable reason to be late. And interestingly enough, reconciliation offered because of the birth of a baby. But right now, all that escapes me as I dread walking in the door after Mass has begun on Christmas morn. I am just stressed. The reading centers me. It is about the shepherds in their fields. It was just a few months ago that I sat in the shepherd’s field. I entered a grotto in the field, decorated to memorialize the event we are hearing about in this reading. 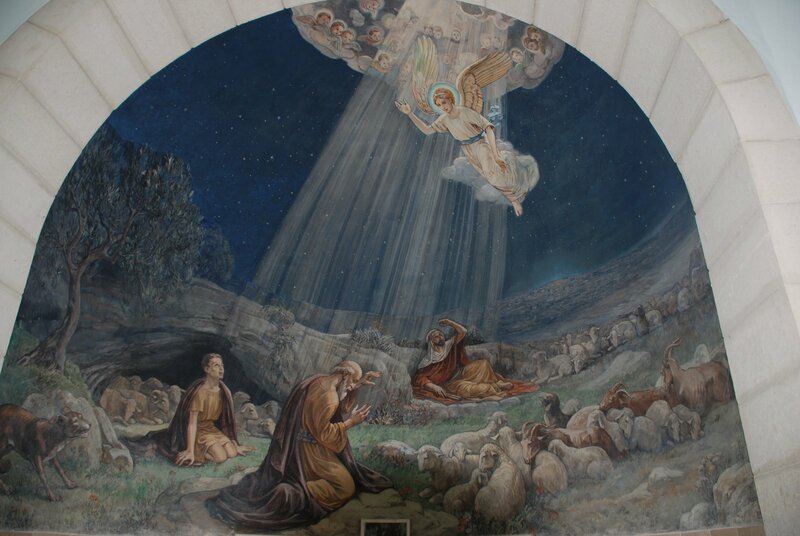 Over the arch of the cave as you enter are the words “In Excelsis Deo.” This simple hole in the rock standing in the field, where even today you see shepherds in the outlying fields, is simple and in many ways, not unlike any other cave on a mountainside. We walk down into the cave and there is a manger scene of the babe, Mary, Joseph, the shepherds and angels. I seat myself on a rock that seems to have eroded away into a bench. The space is small, and we fill it standing shoulder to shoulder. And then spontaneously, we break into song, “Gloria! In Excelsis Deo.” The music is absolutely beautiful; it is as if the angels are singing with us. Really. I am overcome. I can’t sing; I can’t speak. I feel as if I have stopped breathing and time is frozen. Tears are rolling uncontrollably down my face. I ask myself, “Why, Lord? Why here? Of all the places we have gone and we are to go, why am I overcome in a cave in a field?” And of course, the answer comes to me. Because I, like the shepherds, have been called to find Jesus. I have spent years coming to my current relationship with Jesus, and I have been called to hop on a plane and travel thousands of miles to see where He was born. To walk where He walked. To see where He died for me. And I am near. Like the shepherds, I am overcome with the glory being presented. I realize that I am just a shepherd in the field, come to find the King, worship, honor, praise Him, and to share the Good News that He has come for all. My second Christmas Gift. As Mass continues, the incense is lit. As the aroma and smoke fill the room, I am transported back to Bethlehem. I am kneeling at the site where our Lord was born. 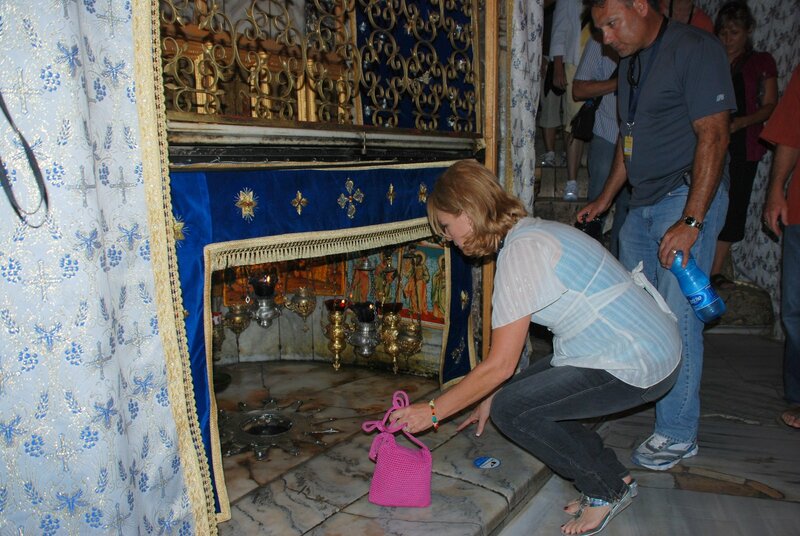 I am kneeling at the site where His manger was believed to sit. The incense burns here all the time. I never thought I would appreciate the incense as much as I do now. During the Liturgy of the Eucharist, the Eucharistic Ministers gather around the altar. I am on my knees watching as Father Lopez prays the words of the consecration. Because of the way the EM’s are standing, I have a very narrow, limited view. It is as if I am looking through a telescope; there is a small opening between two EM’s where all my attention is focused. While I peer through this opening, all I can see is the bread and Father’s hands. Hands are over the bread. They move up and down, blessing the bread. Hands lift up the transubstantiated bread that has become Jesus as I hear the words, “This is my body, given for you.” I am struck by this view. I see nothing but Father’s hands and bread that have become Jesus. It is as if they have united together, human hands and divine grace. I will receive communion with Jesus today because Father has given his hands to be used for this grace. I realize that if Father had not said, “Yes, Lord, I give you my hands to do your Will,” I would not be able to have this great grace I am about to receive. All over the world, there are hands offering this grace that would not be available without the “Yes” of God’s servants called to priesthood. I am filled with gratitude that you said “Yes” and gave yourself to our Lord and His will. Just wanted to say thank you. It was truly a blessed Christmas, and the best gifts I received were not wrapped or sitting under a tree. let us show appreciation and gratitude for our priests, pastors and other religious leaders.